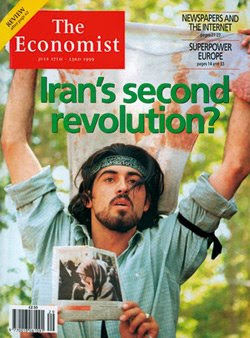 “Iran’s Revolution” or “Iran’s Summer Breeze”? This debate has been going on in the western press for the last week. Is Iran heading towards a change of regime or is it just a “very unusual” event that will “eventually die down”. Is the Iranian split between Ahmadinejad and Moussavi’s supporters, social or religious based? It seems that US press is focusing on the religious divide between “fundamentalists” (Ahmadinejad supporters) and “reformists” (Moussavi), whereas European media prefers to talk about the clashes between “students” (Moussavi) vs. “rural” Iranians (Ahmadinejad), thus hinting at a socio/economic divide. If the western media is right, then if you ever meet a fundamentalist bearded student fighting it out with a clean-shaved reformist peasant; then you’d better either buy a new pair of glasses, or call your psychiatrist. You might find this commentary by a left-wing Iranian-American academic interesting. The gist of it is that there's no basis for the common assumption that affluent/urban=pro-Mousavi & poor/rural=pro-Ahmadinejad. It is interesting that this same dichotomy was used by some in the European Left to justify their support for the Hezbollah led alliance in the Lebanese internal struggle. Their assumptions were no less unfounded.